A well balanced, nutritious diet and regular exercise are vital factors in a healthy lifestyle. 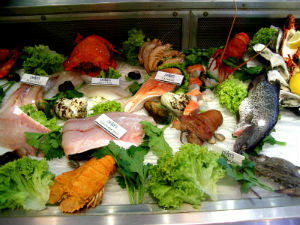 Seafoods which comprises of fish, prawns, crabs, lobsters and shrimp are high in nutrition. They help in constituting a well balanced diet. This week we bring for you a brief overview of the nutritional benefits of seafood and the various delicacies present in our website. Fish is an excellent source of protein and its low-calorie content makes it a healthier alternative to red meats or poultry. Dieters, This is your food! If you want to have all the goodness and nutritional benefits of a well balanced diet minus the fat, then seafood is yours. Seafood averages less than 2% fat. Eating fish two or three times a week can help lower cholesterol and reduce the risk of heart disease. Seafood has very little fat and mostly unsaturated fat. Some shellfishes have very high antioxidant E, apart from vitamins E, C, D, and A. These antioxidants boost the immune system and lower the risk of heart disease. Omega-3s cannot be made by our body and they are found in shellfish. DHA (a long chain Omega-3 fatty acid) is a major building block of the brain and is so essential for the normal functioning of the body. Having extolled all those nutritional benefits, now we get on to the fun part. What does it do to one’s tongue? Wanna know? Well, we have separated these in terms of the broad categories for your ease. Would you like to browse the Fish recipes or Prawn recipes or crab recipes or shrimp? In the Fish category, we have at least 200 odd recipes in all. We have international recipes like barbecued fish and fish terrine, very traditional recipes like the Tanjavur fish curry, fast food varieties like the masala fried fish and spicy grilled fish fillets. This section cannot ever be explained in a single post. It attends to each one’s taste separately. All that I would say, it has to be explored and prepared with love and savored to understand. So, go ahead and splurge your tongue. Prawns also have a separate category devoted. They are a type of shellfish. They are rich in Omega 3 fatty acids. It is vital during an unborn child’s development in the womb. It also assists in neural development as well as eye development of baby. So, this is definitely a must eat for a pregnant woman. Check out the Spanish, Danish, Italian and our very own desi Indian recipes from the prawn recipe section. You could make almost anything with prawns. Pickles, toast, prawn soups, curries, chutneys, sauces, fries, snacks like prawn puffs and prawn cutlet, and what not. You name them; we have a recipe to make them with prawns. Crabs are a great source of nutrition. We have a large collection of Indian, Chinese and international crab recipes. Check out Crab Foo Yung and Crab Xec Xec. Names sound exotic, huh? Your taste buds won’t be disappointed either. Of course we also have the usuals like crab salads, crab gravies and crab sandwiches. Shrimps also are very popular in our website. There are a wide variety of delicious recipes. The ones with the maximum hit are Goan Shrimp curry and Tandoori Shrimp. Shrimp can be prepared in a very Indian spicy way and enjoyed just like the other chicken and lamb dishes. A diet which has a good intake of seafood can reduce cancer, avoid Alzheimer’s disease, keep depression away and reduce the incidence of arthritis. For those beautiful ladies out there, if you need a healthy glowing skin, eat a lot of shellfish which are a rich source of vitamins and minerals. They say fish is your heart’s best friend. We say Awesomecuisine is your kitchen’s best friend. Feel free to comment or share your thoughts on this "Seafood Special" article from Awesome Cuisine.